May 17 2015. I survived and finished the 119th running of the Boston Marathon. It has been nearly a month and I have had time to reflect. It is a big and awesome event--the logistics are challenging, the weather on the day, as it turned out was awful--windy, wet and cold. But the runners are amazing, from all over the world and all levels of fitness, some running for charity others for personal goals, a few for glory. 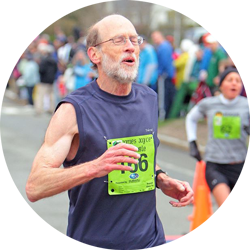 I was running my first Boston Marathon at age 69. I qualified last June in my first marathon ever at a time of 3:18+. That should have meant I had a chance at an age group medal. But I knew going into the race that was not possible. Last August I suffered an upper hamstring injury and in the ensuing months have re-strained it a number of times either in a race I was committed to, or in training for such a race. Two weeks before the race, when training had been going okay and I was finally able to run some consistent miles at sub 7:30 pace, I re-injured it. After going 'cold turkey' for 4 days, I restarted on the 5th day and found that I could now run 10 minute miles but any faster would risk re-injury.By the third day I was able to run around 9:30 a mile for a few miles...Should I still go to Boston or not? As a trained economist I knew I should 'ignore sunk costs.' I should not race just because I had already registered, bought an airline ticket, and so on. I should be forward looking and compare the benefits with the costs. The costs, going forward would be substantial--the race could not be pleasant. I would be running slowly and with some pain. But the benefit side dominates. Would I ever have another chance at Boston? Perhaps, but at age 69 nothing can be taken for granted. So of course I decided to go for it! I decided to stay outside of Boston in a little motel in the quiet town of Bedford where my father grew to manhood in the 1920's and 1930's. My dad was not a runner and was probably a little disappointed that neither my brother nor I had his talent at baseball. He was a pretty fair catcher, at least at the high school level. But he enjoyed my running,especially after I brought home a big trophy. A connection to his hometown can only help. Of course it means I have to drive to an end-of-the-line T stop (on the Red Line) at Alewife Station, take the T into the Common and then bus out to the start. Still it should be easy. My Wheels for the Weekend-Pretty snazzy! After flying in, I stopped in the Blue Hills on the way to my motel and enjoyed a relaxing hike around Houghton Pond. A Quiet Weekday in April in the Blue Hills Reservation at Houghton's Pond - Very Refreshing! On Saturday I jogged along the Battle Road in the Minuteman National Park--only 15 minutes from my motel--retracing the steps of the rude Colonials. At the end of my jog, shooting over my shoulder to the parking lot-a beautiful spring day--too bad it didn't repeat on Patriot's Day! Looks like the right place! T-shirt time after getting your number! Then out from the Convention Center and join the throngs on Boylston Street. On Boylston Street on the 19th of April, looking toward the finish line where we hoped to be in about 24 hours! -When leaving motel, lock door and deposit wallet in shorts pocket, throw casual shorts in trunk of car. Put a little bit of cash [10's, 5's, and 1's] in jeans pocket and put jeans in gear check bag. -After park car at T-station, remove T-pass from jeans pocket, put car keys in jeans pocket inside gear check bag. Have T-pass in your hand or in a pocket on clothes you are wearing! -At Boston Common, place T-pass in jeans pocket and place anything else you don't need in the gear check bag. Check the bag! Get on the bus! I was planning to wear old shoes and socks, with my racing shoes (with a clean pair of racing socks stuffed inside) tied in a knot and looped around my neck or in my hands. I had an old hooded sweatshirt and sweatpants (bought at Good Will shop a couple of days before) to wear over my racing gear. Because it was going to be cold and possibly rainy, I decided on a long-sleeved tech shirt and shorts to run in. In the morning everything went smoothly. As I approached the T-stop exit in my car, however, I suddenly realized I did not have my wallet in my pocket and momentarily panicked--Understand that in my day-to-day world, I *always* am checking my jeans pocket for the presence of a wallet when I leave the house, get into or out of the car and so on. But then I realized with relief that my plan was to not have the wallet in my person but in the car. So parked the car, the T-pass worked perfectly, I boarded a subway train within 5 minutes or so and was at the Boston Common shortly after 7. My wave was to board buses between 7 and 8. I checked the gear-check bag and boarded the bus wearing only the racing togs I would run in and items that I can throw away in the Athlete's Village (AV), namely old shoes, socks, hoodie and sweatpants. It was a longer bus ride than I anticipated-we joked that they must be taking us to Hopkinton via New Hampshire. When we arrived, we piled off the bus to discover the clouds had just opened up and there was a steady rain coming down--Someone called out, "Not a good sign.'. But the rainstorm actually passed over pretty quickly. But when I got to Tent 3 in the AV, I found that the rain had driven loads of people under the tents. In fact it was wall-to-wall people. No entrance I found could be entered without being totally rude. This was a little problem as the drinks and food were underneath the tents. One of the volunteers was actually passing some food out to outsiders who could not get in but that was only a partial solution. Eventually I realized there was another whole field with two more large tents beyond the one I was in. Those were not as packed so I could spend some time underneath and inside the tent where it was warmer and protected. There were plenty of port-a-potties around the edge of the fields for those who planned ahead. Those who had less foresight relied on the kindnesses of others to let them cut in line when their wave needed to leave and they still hadn't made it to the front of the line. All in all the AV worked pretty well, considering the less than ideal conditions. Eventually my wave was called and I joined the throngs moving out of the Village toward the starting line--all well organized and pretty easy. Eventually we were allowed to go into our corrals; I opted to move to a slower corral (because of my injury). I was next to a middle-aged guy who had run 4 or 5 of these who kept telling me and the other guys around me, in his proper Bostonian accent, to enjoy it--especially when we got to Wellesley College, famous for the rabid cheering they do ffor all of the runners--"Have fun with it! Don't be like me the first time I ran when I stayed out in the road, serious runner, head down, focused on a good time--Go over to the roadside, give 'em a kiss, whatever, just enjoy it! They're screamin' their heads off for you so just enjoy it!" I wasn't sure how that would really work if the run was as painful as I feared but stored it away just in case. Eventually the gun went off and we walked forward, then got to a slow jog, and then eventually into a run and I started to see many people leaving me behind and others passing me, but no problems in terms of bumping or jostling. Initially I was able to find something like an 8:30 pace, not what I would normally want, but certainly no slower than I anticipated. Every time I planted my right foot, I had a reminder of the injury in the form of dull, background pain. My job was to keep a pace going that would keep the pain in the background, not come to the forefront. The crowd along the roadsides was incredible. Over the first few miles there were a few places where it was a little thin but over most of the race, even with the weather being uninviting, there were lots of spectators. Later when we got into Boston, especially at the big intersections, the crowds were deep--and always loud and encouraging! It helps--maybe especially on an off day and this was about as far off a day running as I ever hope to have. 5K 25:48--so I was feeling like I would at least average under 9:00 per mile which should keep me under 4 hours overall-not what I was looking for but at that point would certainly take it. Little did I know how much fitness I had lost over the past two months. The 10K split-52:48 --so 27:00 for the second 5K still under 9 per mile but just. The 15K split-1:21:36 or 28:48 for the 3rd 5K, now over 9 minutes per mile pace. I hit the half way point in 1:58:35 so it was still possible I could break 4 hours for the run if I could start to accelerate a bit. But it went the other way--I did enjoy blowing a kiss or two to the cheering Wellesley fans and occasionally gave people a wave but the last ten miles was very tough. I never 'hit the wall' but just got steadily slower. I suppose a cynic could say I wasn't going fast enough to hit the wall and that's probably right, but I am also glad I didn't bump into it at my slow, but unsteady pace. But there were many memories of encounters that helped me keep going. If I would start to feel a little dejected there was always a new runner to check out--It might be a middle-aged Japanese man with a flag attached to his headband, waving to the crowd as he ran. A young Japanese man and his friend were running with a video camera hooked up to a framework with a wheel on the bottom, taking video of the crowds as they ran through. At one point I caught up with one of the differently abled runners who was running on two 'springs' from the knees down. He was bouncing ahead but mostly from side to side, advancing maybe a foot or so for every 2 strides. That was inspiring for me; if I had felt like quitting it would be pretty hard to justify to that guy! The weather, with the headwind occasionally blustering and more raindrops falling, did not help. But I would not have run much faster had the day been perfect. I could feel my stride shortening and knew I was just skimming along the road surface to conserve energy. I started to worry whenever there would be a raised brick crosswalk or if we had to run across trolley car tracks that I might trip and fall. I was not sure I would get up if it happened--But luckily it was just a worry--Nothing bad happened and I did eventually finish with lots of people around me in a time that I could never have imagined, over an hour slower than my 3:18 qualifier, in 4:20:53. But finish I did--and had the medal to prove it! After the finish the volunteers were terrific. Got my medal, got some food, got some liquid--One lady volunteered to open a power bar for anyone whose fingers were not up to it-that worked for me! Later, after picking up my Gear Check bag and heading to the changing tent, there was a young man who smilingly volunteered to undo any knots that were difficult. Considering the cold and wet, it was very welcome. Once I got inside the changing tent, things were much warmer and I started to feel somewhat human again. A guy next to me said, "Glad to see you're okay-you were shaking like a leaf out there. And okay I was, indeed. Nothing to do after that but head over to the edge of the Common and down the Escalator into the T--catch the Red Line out to Alewife station--into the car and back to the Motel. Into the shower and then rest-Ahhhhhh!